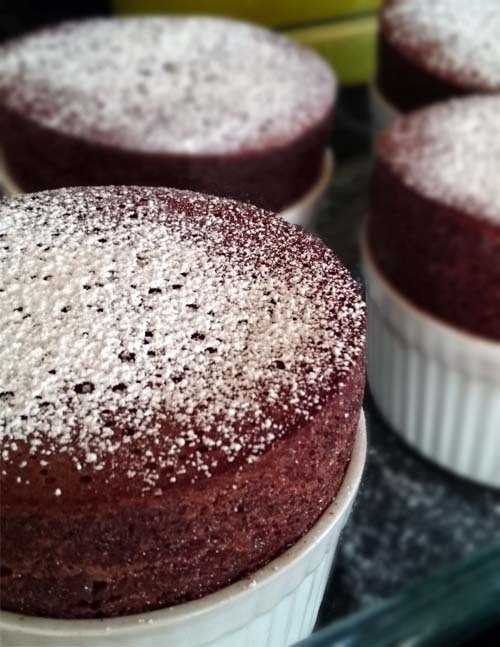 I followed a video from YouTube to make these delicious chocolate souffle. It's included below. You'll need 4 ramekins (3.5 in) and a double boiler. If you don't have a double boiler, see this DIY double boiler setup from rachaelraymag.com. 1. Preheat oven to 375 deg F. Prepare the ramekins by buttering the inside and dusting it with granulated sugar. The video shows the proper way to do this step. 2. In a small saucepan, combine milk and cream and stir over medium heat until boiling. Remove from heat, add chocolate and set aside for 1 minute. Mix well until all of the chocolate has melted. 3. Over a double boiler, add the cocoa powder and water to the saucepan. Whisk until very hot. 4. Remove from the heat and allow to cool for few minutes. 5. Whip the egg whites with salt until foamy. Add sugar slowly while beating until stiff peaks form up. 6. Add egg yolks to chocolate mixture. Whisk thoroughly to combine. 7. With a rubber spatula, scoop 1/3 of the egg whites into chocolate mixture. Combine well. Then fold the chocolate mixture into the remaining whites. Spoon batter into prepared ramekins. 8. Bake for 13-15 minutes until the souffle has risen to about 1 1/2 inch above the rim. 9. Remove from the oven and dust the top with powdered sugar. Serve immediately as the souffle will begin to deflate after in a couple of minutes. Just be careful of the hot ramekins.